2 inches at 50 yards with 100 lb pull. These crossbows were offered for sale at Bass Pro in their Bargin Cave some months ago. I don’t sell crossbows, which I believe is what you thought. I do sell books, including one titled Crossbow Hunting which I wrote. The Stryker was pulled from the market because it would streatch the strings in storage, was very heavy and complicated and although very, very fast, just did not pick up much of a following because of its size and weight. It was replaced by the Desert Stryker which was much simplified, without the built-in cocking crank, and not as powerful. I suppose that you could buy an occasional used one or maybe even find one nearly new. I just don’t know. I do not sell crossbows although I do sell books about them and blog about them fairly often. 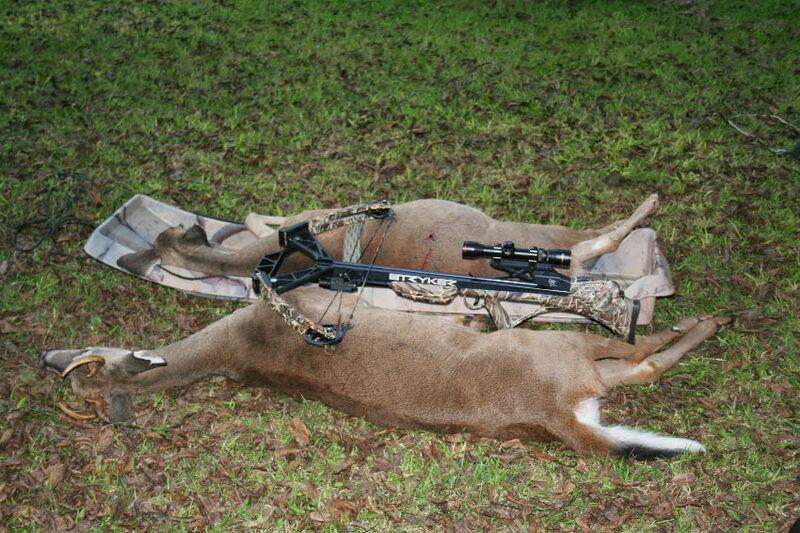 Stryker crossbows are awsome. I killed a 6/6 elk at 82 yards and several whitetails at around 50 yards. I love them! NICE I WOULD LOVE TO HAVE ONE…..
You will have to go to the used crossbow market now. Just picked one up. Brand new never used. Still had tape on it. Was on here looking for info. I got it from the parents of the store owner who just passed away. It was hidden in the back of the store behind a pile of empty cases for about 2 years. Was told it took “longer” bolts than normal. It didn’t have any with it so I don’t know what that means. They had no idea either. Any ideas? The arrows that Bow Teck shipped with the Stryker Crossbow were carbon shafts with 1/2 moon knocks and 22 1/4-inches long (not counting points) and about 5/8ths inches in diameter. These were not the skinny carbon shafts. I have just purchased the 350 model, it also came with the 1/s moon knocks, but i have purchased the flat knocks and they do the same. The bolts were the same size as all the newer carbon bolts you can buy anywhere. got the styker new many years ago and have killed many deer , and a coyote. never been a problem just a awesome crossbow . I like mine too, except for the problem of string stretch. It still works, but I can’t get it back into its case unless I replace the string and tighten up the limbs.